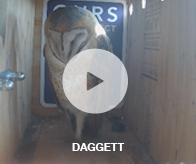 The owls are fashionably late this year for some reason but we just had a mating pair move in to the Daggett box yesterday so we are going live. 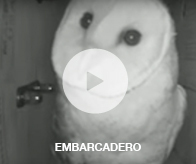 We have a single owl in the Embarcadero box who should be joined by a mate soon! Our cameras are down for the season – check back in December. The owl’s breeding season has cycled here at the Port and the fledglings have taken flight. The chance we get to see them grow before our eyes is always a fascinating and fun experience. We at the Port thank you for your continued interest in the Owl Box Program and the ability it gives us to peer in as they start their lives as our rodent control officers. Stay tuned for more intriguing footage next year beginning in December when the Owls return to roost yet again. 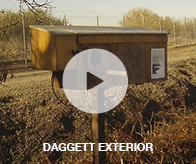 The owl cams are live and we currently have one pair in the Daggett owl box who should begin nesting soon! Also new this year is sound in the Fyffe box to add to the experience. Looking forward to an exciting new year with the owls! The owl’s breeding season has cycled here at the Port and it was a very interesting year with the wet winter we encountered. We are glad to say the surviving fledglings have taken flight. The chance we get to see them grow before our eyes is always a fascinating and fun experience. We at the Port thank you for your continued interest in the Owl Box Program and the ability it gives us to peer in as they start their lives as our rodent control officers. Stay tuned for more intriguing footage next year beginning in December when the Owls return to roost yet again. They say, “Don’t count your chickens before they hatch.” But they don’t say anything about owls. Our Barn Owls have been busy. Check out our Daggett (6 new eggs!) and our Fyffe Ave, (6 new eggs!) 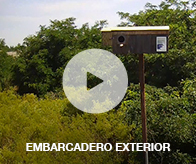 live cams to see for yourself. Refresh the page if the feed times out or become non-responsive. View in the evening or at night. Barn owls are strictly nocturnal and the most interesting stuff happens at night. For the best viewing experience we recommend that you use the most updated version of your browser. Barn Owls eat mainly small mammals like voles, shrews and mice. Prey is sometimes swallowed whole and indigestible parts are then regurgitated (coughed up) in the form of an owl pellet. Barn Owls do not hoot - they screech. The scientific name for Barn Owl is Tyto alba which means "white owl"
Barn Owls have remarkably long legs, toes and talons enabling them to catch prey hidden at the base of deep vegetation. When viewed from above Barn Owls are quite well camouflaged, as the rough grassland over which they usually hunt is predominantly light brown for most of the year. When viewed from below their white under sides are hard to see against the light of the sky. Barn Owls hunt at night, and although they have very good eyesight, they rely mostly on their sense of hearing. Researchers found that in total blackness Barn Owls are still able to find the smallest of prey because of their excellent hearing. Owl ears are located one higher than the other, which helps them to pinpoint tiny sounds. During flight, the left ear captures sounds below while the right ear focuses on sounds from above. The feathers on the edge of the Barn Owls' face create a disc, which works to trap and focus sound, rather like our outer ears.